Last Thursday, January 12, Master Naturalist (and current ARMN Treasurer) Josh Schnell enticed some 15 of his USDA OLC (Office of Legal Counsel) colleagues to Barcroft Park for a couple of hours cutting and digging Multiflora Rose, English Ivy and Japanese Honeysuckle. Five Americorps volunteers supported the effort, as well as four other MNs (thanks Jim Clark! ), and tools were supplied by Sarah Archer. The day was sunny and a balmy 58 degrees, and with the ground wet from the previous day’s rain, the invasives were very vulnerable. We took full advantage of the conditions, and massive R. multiflora clumps and root systems yielded to shovels and pickaxes. We continued to clear the area between the bikepath and drainage ditch, exposing the Lesser Celandine that is the dominant invasive there. There were large numbers of Ranunculus ficaria bulblets and tubers just below the ground surface, which, no longer protected by their cover of Rose and Ivy, are vulnerable to spraying in spring. For more on Lesser Celandine, including a shoutout to our own Steve Young, see: http://www.nps.gov/plants/alien/fact/rafi1.htm. Several of the lawyers last Thursday were interested in the work we are doing in Barcroft, and the philosophy of invasive species removal in general, making for some lively Q&A and cross examination on the reasons we do what we do, and providing an opportunity to cite Tallamy’s work. Very enjoyable exchanges of perspectives, and we may be joined (either in Barcroft or other RiP sites) by some of them in the future. Speaking of the future, consider joining the work this Saturday the 21st, as we will be working the same area again in Barcroft beginning at 9:30 a.m. See you there! Picture courtesy of Antony Lee of Americorps. This entry was posted in Barcroft Park and tagged community outreach, invasives, native plants, restoration by christinearmn. Bookmark the permalink. 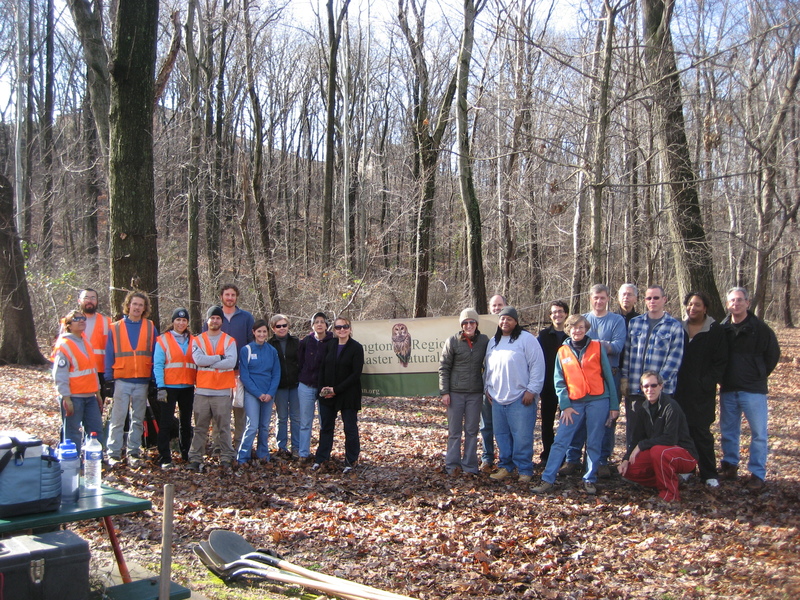 To the folks from USDA’s OLC, thank you for coming out to improve the habitat in Barcroft Park! This was a great event on a beautiful day, thanks for hosting it and having us out!